As a specialist in gastro-oesophageal disease, Mr Clarke offers the most up-to-date investigation techniques including endoscopy, high resolution manometry, 24-hour pH & impedance testing. What are oesophageal physiology studies? Oesophageal physiology studies are a series of investigations that are used to accurately assess the muscle function in your gullet (oesophagus) and stomach, as well as measure levels of acid reflux over at least a 24 hour period. They involve two key investigations, a high resolution manometry test and 24-hr pH / impedance test. Why might my specialist recommend these tests? This test is often recommended in patients who are being considered for anti-reflux surgery, in order to assess how well the muscles of the gullet are functioning and whether there is a link between acid reflux and a patient’s symptoms. It is also valuable in the investigation of patients with difficulty swallowing (dysphagia), to exclude disorders affecting the muscles of the oesophagus (gullet) such as achalasia or distal oesophageal spasm. What do the tests involves? A thin tube is gently passed into a nostril to the back of your nose. You will then be asked to drink a cup of water through a straw, which will help to move the tube down through your oesophagus into the stomach. Your breathing will not be affected during the procedure. Once the tube has been passed you may have the sensation of a ‘lump’ in the back of your throat. It will feel slightly uncomfortable rather than painful and will settle quickly. You will then be asked to lie down. The tube in your oesophagus will be connected to the equipment which measures how well the muscles in your oesophagus are working. This recording takes approximately 10 minutes. During this time you will be asked to be still, quiet and have relaxed breathing. You will also be asked to swallow small mouthfuls of water at regular intervals until the test is complete. A thin tube is gently passed into a nostril to the back of your nose. You will then be asked to drink a cup of water through a straw, which will help to move the tube down through the oesophagus into the stomach. Your breathing will not be affected during the procedure. Once the tube has been passed there will be the sensation of a ‘lump’ in the back of your throat. It will feel a little uncomfortable rather than painful and will settle within quickly. The end of the tube will be positioned in your oesophagus above your stomach. The tube will be taped to the outside of your nose, passed around your ear and attached to a small recording box which is worn on a shoulder strap or belt around your waist for 24 hours. You will be given instructions before you leave and asked to fill in a special diary of your meals, bedtimes and symptoms. You will be sent home and be able to eat, sleep and carry on normal daily routines. You will be asked to return the following day to have the tube removed. This takes a few seconds and is painless. Both tests are usually very safe. They might cause some discomfort but should not be painful. You may feel slightly sick when the tube is first positioned, but this should settle quickly. Other mild side effects may include: sore throat, nosebleed, a runny nose, fainting or wheezing. There is a very small risk that the probe could damage the oesophagus, but this is highly unlikely as the tube is very flexible and the practitioner who does the test has specialised training. During the test most patients are able to carry on as normal. Some prefer not to work because they feel self-conscious about having a tube coming out of their nose. NB If you have any allergies please inform the practitioner carrying out your test. If you are pregnant, please inform the department by telephone before your appointment. You may go back to normal activities. When you return after 24 hours to have the tube removed you may restart any medication you were asked to stop. 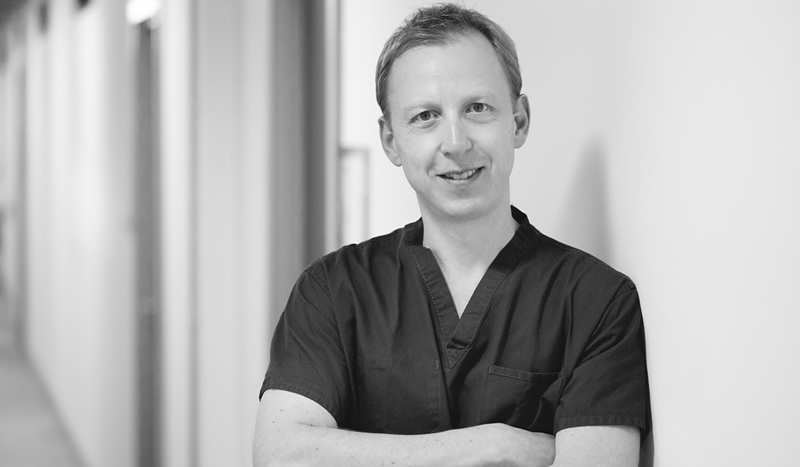 Your test results will be analysed personally by Mr Clarke, who will issue a report and be able to discuss the results with you at your next clinic appointment. This is a procedure in which a thin flexible telescope is passed via the mouth to examine the lining of the oesophagus (gullet), stomach and small intestine (duodenum). It has a tiny light and a camera at one end that enable the images to be displayed on a television screen. Why might I need an upper GI endoscopy? You must not eat or drink for at least 4 hours before the procedure, although you may drink a small cup of water up to 2 hours before the test. You should take your regular prescription medications, unless you are otherwise advised by Mr Clarke to stop any specifically for the test. Should I have throat spray or sedation? The test is normally carried out whilst you are conscious, using either throat spray (local anaesthetic to numb the back of your throat) or a sedative injection to make you slightly drowsy. Most people tolerate it with throat spray alone, allowing quicker recovery after the procedure and return to normal. If you do have a sedative there is a longer recovery, you cannot drive, work or operate machinery for 24 hours and you would need someone to take you home and stay with you for that period too. You will be positioned comfortably on your left side and a small mouthguard placed to protect your teeth. Once the throat spray or sedation has been given, the small telescope will be passed through your mouth and into your throat. It will not interfere with breathing. Air is passed through the telescope to give a better view, which can make you feel bloated or the need to belch. Any saliva that collects in your mouth is removed by the nurse using a sucker. During the test a tissue sample (biopsy) may be taken for laboratory examination. This is normally painless. Sometimes a treatment such as stretching of a narrow area (dilatation) may also be performed. The test normally takes between 5-20 minutes. If you have throat spray you cannot eat or drink for one hour after the procedure, as the local anaesthetic temporarily affects your swallowing. If you have sedation, a friend or relative should collect you and ideally stay with you for 24 hours, during which time you should not drive, work or operate machinery. Complications are very uncommon following diagnostic endoscopy (less than 1 in 1000) but may include bleeding, perforation or a reaction to the sedative drug. If you develop difficulty swallowing, increasing abdominal or chest pain, pass black or bloody stools, have a fever or are worried, you should contact your GP or emergency department. Mr Clarke will discuss the results with you immediately after the test and will provide a written report for you to take home. A copy will also be sent to your own GP.